Matthew Peterson: You’re listening to The Author Hour: Your Guide to Fantastic Fiction, which can be found at www.TheAuthorHour.com. I’m your host, Matthew Peterson, author of Paraworld Zero, which some reviewers have compared to Harry Potter, Star Wars, and Artemis Fowl. 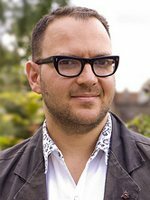 My next guest is Cory Doctorow, New York Times bestselling author of Little Brother and Makers. For the past three years, Forbes magazine has named Cory one of the top 25 web-celebrities in the world. According to technorati, his hugely influential tech culture blog called Boing Boing is the most poplar blog on the planet. A huge advocate of filesharing and liberated copyright laws, Cory has received the John W. Campbell Award for Best New Writer, a Locus Award for Best First Novel, the Sunburst award, and the Prometheus Award. Plus his writing has been nominated for the Hugo, Nebula and British Science Fiction awards. Welcome to the show today, Cory. Cory Doctorow: Oh, thank you very much. Matthew Peterson: Now your first book, Down and Out in the Magic Kingdom, was the first novel released under one of the Creative Commons licenses? Cory Doctorow: It was the first novel ever released under Creative Commons licences, that’s right. Matthew Peterson: The very first one . . .
Cory Doctorow: Came out the same month as the Creative Commons licenses came out. Matthew Peterson: So I know a lot of people don’t really understand what that is. What does that mean exactly, the Creative Commons license? Cory Doctorow: So normally copyright says that as soon as you make something, it’s all rights reserved; you don’t even have to write all rights reserved on it. All rights are reserved to you, and that includes a whole bunch of things that in the non-internet world, where you don’t have to make copies, you wouldn’t think the copyright would stop you from doing, or copyright doesn’t stop you from doing. So in the non-internet world, if you want to loan someone something, it doesn’t violate copyright law, ‘cause loaning doesn’t involve making a copy. Whereas, in the internet, loaning someone something always involves making a copy, ‘cause everything you do on the internet involves making a copy. Same with if you write out a story based on another story and you want to share it with your friends. Generally, copyright either doesn’t affect that because it’s fair use. That’s to say that it’s an exception to copyright or just because copyright holders can’t figure out how to sue you because you’re trading a handwritten manuscript back and forth among friends. Cory Doctorow: But as soon as you do it on the internet, first of all you’re making lots of copies and second of all you’re visible to all these enforcement tools that go around the internet looking for people who are violating copyright law. So a lot of us feel like just because you’re doing it on the internet doesn’t mean that it should be illegal. You know, people have done this stuff with books for as long as there have been books. Certainly longer than there’s been publishing or copyright. People have been writing... re-writing the stories they love and sharing the books they love and so on. And so what Creative Commons does is gives you a really easy way to mark your books or other content in a way that says some of the rights are reserved--the rights that you need as an artist to make your commercial fortune--but the rest of the rights are not. The rest of the rights you’re giving up or giving back to the public. So there’s a few different kinds of Creative Commons license, and when you go to the Creative Commons webpage you can pick which one you want. The one I use says you can make new uses out of this work, so you can make say a song or a video or your own stories out of it; you can share it, but you have to do so non-commercially. You can’t charge money for it, and you have to let other people share and re-mis the things that you make. So it’s kind of a virtuous circle. Cory Doctorow: Well, you know, it turns out to have been pretty straight forward. Well, I’m very lucky in that my publisher’s pretty forward looking, and specifically my editor is the most senior editor at my publisher, Patrick Nielson Hayden at Tor books. And he’s a good old fashioned geek. You know, we met on a bulletin board system back in the ‘80s called Genie. And you know, he has his own Lennox machines and so on. And when I suggested to him that I wanted to do this, he said, “You know, this whole ebook business has got the worst ratio of hours spent in meetings to dollars generated in income of anything this publishing house has ever done. We’ve been jabbering about this for years without ever actually seeing what people want to do with ebooks. So yeah, if you’re game, we’re game!” And you know, as far as anyone can tell, it didn’t hurt me. And there’s pretty good reason to believe that it helped me. And so he’s keen to have me go on doing it and all the other publishers I’ve worked with since have followed suit. Matthew Peterson: Someone once told me, I can’t remember who it was, that there’s a bigger problem an author can have than piracy and that’s obscurity. Matthew Peterson: Yeah, so and you’ve continued to do this with your new book, Makers. Now of course the physical book is available as well, so people can read the online one. In fact, I think Tor.com actually has... does it have the entire manuscript online on their website? Cory Doctorow: Well, they’re serializing it and they did it in 81 parts. Cory Doctorow: So I guess, you know, another way of thinking about “the problem isn’t piracy, it’s obscurity” is that free ebooks for the most part entice people to buy printed books. Cory Doctorow: That is, someone who reads a free ebook and gets far enough to realize that they like the book, generally doesn’t have much of a problem buying the printed book. Cory Doctorow: Printed books aren’t very expensive; they’re pretty easy to come by. And screens aren’t a great way to read long form work, not necessarily because the screen isn’t sharp enough. Everyone says, “Well, what happens is screens get better.” But really because computers are just too good at doing everything for us to do any one thing at them for very long. I don’t know about you, but I find, you know, seven minutes is about it for me before someone points me to a YouTube video of a guy sticking a lemon up his nose. Matthew Peterson: [laughs] Yeah, yep. Cory Doctorow: And it’s just not really well suited to long form reading. And even the so called digital generation, you know, the research bares out that by and large when they want to read a long form work, paper is much better for them than electronic. And since paper is cheap and easy to come by, you read some of it and you decide you want to by the print book and then it’s really easy to find the print book and doesn’t cost much. So it seems like it’s selling more books. I mean, even my young adult novel, Little Brother, which was aimed at kids, who, you know, famously kids are time rich and cash poor. So generally speaking, they’ll trade time for money whenever that opportunity is presented to them. Even the kids book was an incredible seller. It was a New York Times bestselling novel, you know, 90,000 hard covers in print. I mean, it’s just done incredibly well. Here we are nearly two years after the book first came out and they still haven’t brought out the paperback ‘cause the hard cover’s selling so well. Matthew Peterson: Tell us a little bit about your ideas for Little Brother. What was your motivation in writing it? Cory Doctorow: Well, I guess there were lots of reasons to write it, but I think the one that really sticks with me, you know, a couple of years after having finished it was that it seemed to me that when I was a kid, computers and networks expanded my horizons, that I went from being someone who lived in a fairly enclosed world, where--you know, I didn’t have a lot of social power, and the places I could go and the people I could meet and the ideas I could encounter were pretty limited--to a world where it was more open, where I had access to more tools and ideas and communities than I had ever had before. You know, I started using computers pretty early. My dad was a computer science teacher and, you know, in 1979 we got an Apple 2+ at home and a modem and I really went to town with it. And it seems to me like today if I was a kid, I would really think of computers and networks as things that were closing down my horizons, by and large. We’re surveying kids using the networks. Marketing creeps are following them around. We are using cell phones to follow them as they move around the city. We’re using all of this technology to sort of spy on and control and limit the scope of what it means to be a kid. And I worry about that, ‘cause I think that if you grow up feeling like technology belongs to the people who have power and control as opposed to regular people, then you won’t find in technology all those wonderful opportunities that were really important to me, that really opened up my horizons. Cory Doctorow: Yeah, it’s about kids who figure out how to use technology to fight against the war on terror. To get San Francisco out from under the grips of a paranoid and hysterical department of homeland security, who basically put the city in lock down after a terrorist attack and have treated everyone in the city as a potential terrorist. Matthew Peterson: And that’s very timely. And your next book, Makers, it’s not YA. Tell us a little bit about Makers. Cory Doctorow: Makers is about people who make gadgets, who invent new technologies even though there’s no more money left in the system, even though the economy has collapsed. And they figure out how to go on making things, just for the love of it, in little cooperatives all across America: occupying dead malls and recycling junk yard technology to re-invent the economy. And I wrote it as a kind of parable about the dot com collapse, which I lived through in San Francisco in ‘99 and 2000. And it was really interesting ‘cause the money just sort of vanished out of the city of San Francisco, overnight. And it went from this boom town to this ghost town, but the people who were left behind went on creating, even though there was no money left in it. It turned out that you didn’t need like a foosball table and an aeron chair and a weekly massage and a barista to invent the web. All you needed was a laptop and someone’s WiFi. And you know, that’s where all of Web 2.0 came out of really, was were these people who went on making even though the money was gone. And they made for love. They made the things that they thought the world needed, not the things that some pointed headed boss thought he could get venture capitol for. And it becomes such a huge success that of course it attracts all this money, just like Web 2.0 did, which creates another bubble, which creates another crash. But after the crash, having learned their lesson, they go on making. And that’s the second act of the book, is	what happens when people really have no money and they go on making. And they end up getting sued by big companies and fighting these legal battles and creating these new kinds of organizations and fighting pitch battles in the street and eventually prevailing, I think, it’s fair to say. Matthew Peterson: Well, your books are very timely: Little Brother with the homeland security and Makers with the economy is really collapsing. I live in Arizona and I can tell you it’s really hurting here too. Cory Doctorow: Well it’s funny, ‘cause I had no idea the economy would collapse [laughs] when the book came out; it was really about the last economic collapse, not this one. Cory Doctorow: I guess I just got lucky. Matthew Peterson: Yeah, yeah. What are you working on now? Cory Doctorow: Well, so I’ve just finished my next book which is another young adult novel called For the Win, and it’s about gamer kids in the developing world in India and in China, Singapore, Malasia, and in California who form a global trade union, who form basically a resurgence of the old industrial workers of the world, only they call themselves the Industrial Workers of the World Wide Web. And they organize using video games, where their bosses can’t follow them because they’re better at the games than their bosses are. Matthew Peterson: [laughs] Well, that is exciting. I’m excited to look for the For the Win. Well, we’re about up for a commercial. It’s been so nice talking with you, Cory. Cory Doctorow: Nice chatting with you too. Matthew Peterson: I’ve been speaking with Cory Doctorow, New York Times Bestselling author of Little Brother and Makers. Thank you so much for being on the show today, Cory. Cory Doctorow: Absolutely my pleasure. Thank you. Matthew Peterson: Alright, make sure you visit www.TheAuthorHour.com to listen to the bonus questions that didn’t make it onto the live show. I’ve still got Mindy Klasky and Garth Nix coming up next. So, don’t go away.